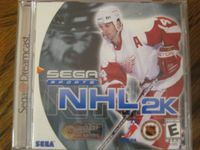 NHL 2K is the first in the NHL 2K series of NHL Hockey games published by Sega. It was a Dreamcast exclusive and one game in the line of Sega Sports titles exclusive to the Dreamcast system. It eventually sold enough copies to become one of the games in the Sega All Stars line-up of budget games.